Portoferraio, Italy – The International Melges 32 Class Association (IM32CA), alongside of host Lega Navale Italiana Portoferraio is proud to welcome a robust and highly-qualified fleet of nineteen teams to the waters of Portoferraio, Italy this weekend. Three days of the fastest and most thrilling one design racing will commence on Friday, 31 May and run thru Sunday, June 1. A maximum of eight races are scheduled with a discard coming into play after Race Six. Light wind is currently in the forecast. Leading the overall 2013 Melges 32 Audi Sailing Series after two events is Andrea Pozzi’s Bombarda, followed closely by Porto Ercole champion Lanfranco Cirillo on Fantastica in second, and Edoardo Lupi’s Torpyone is third. All three will be back to compete in Portoferraio in an effort to defend, and potentially advance to the next round with victory. In addition, the Class anticipates heat from top challengers such as Vincenzo Onorato’s Mascalzone Latino, Gaeta champion Valentin Zavadnikov’s Team Synergy, Edoardo Pavesio’s FRA MARTINA, Marc de Antonio’s Bribon-Movistar, Roberto Tomasini Grinover’s Robertissima and Deneen Demourkas on Groovederci. Making a grand return to the European arena is Jason Carroll’s Argo representing the USA. Three teams from Japan will also make an appearance – Keisuke Suzuki’s Swing, Daisuke Kimura’s Quetefeek and Naofumi Kamei’s Mamma Aiuto!. Portoferraio happens this weekend, organized by BPSE B.Plan Sports & Events in full coordination with the IM32CA and Melges Europe. The next events takes place in Torbole (Event No. 4 on 12-14 July). The final event will be the 2013 Melges 32 World Championship on 18-22 September in Porto Rotondo, Italy. The Sailing Series continues its test drive tradition in 2013. At every event, the Audi Quattro Instructors will be available to guide all those interested in experiencing some of the most recent Audi models. The Audi A3 SB, RS5, SQ5 and S6 Avant will be available in Gaeta. For more information and test drive bookings, please call 345.3472530 or send an email to the Audi Quattro Experience. 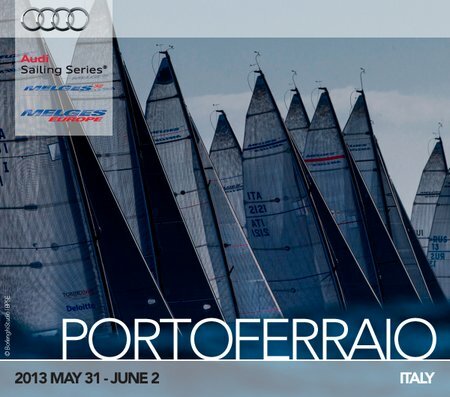 B-Plan Sport&Events is committed to greater visibility and appeal of the 2013 Audi Sailing Series. The event has three newly renovated websites: www.audisailingseries.com, www.audisailingteam.it,www.bpse.it – and a new Facebook page http://www.facebook.com/AudiSailingSeries. Updates are also being posted as the racing happens at the Official Facebook Page of the International Melges 32 Class Association too! Press releases are distributed in three languages – Italian, English and German – written and released at the end of each day. All photos will be posted online at melges32.com thanks to a renewed collaboration with Studio Borlenghi. Zerogradinord will produce interviews and video highlights available on the Official Audi Sailing Series YouTube Circuit Channel. 11.) Naofumi Kamei/Manuel Weiller, Mamma Aiuto!